Patrick Markee is the former deputy executive director for advocacy at Coalition for the Homeless in New York City. A long time advocate, he is a member of the board of directors of the National Coalition for the Homeless. 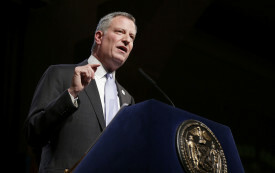 How New York’s Bill de Blasio inherited a homelessness crisis—and then got blamed for it. With homeless rates at record highs, America needs a bold new housing policy.